Time runs fast in the summer. I’ve already pulled up all late spring veggies that were done, and am now heavy into tomatoes, squash and beans. Soy plants in the raised beds. They're big. About 4 feet tall and bushy. 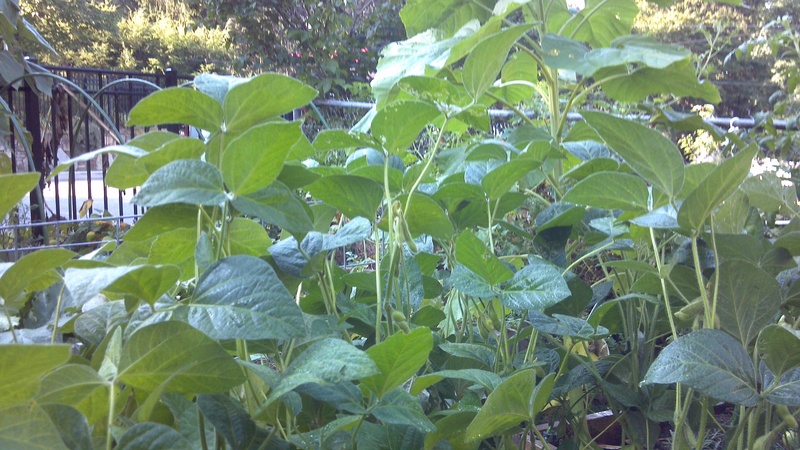 And speaking of beans, the edamame that my kids and I planted are coming in strong. That’s an easy seed for little kids to plant — they are big, round, white seeds– so they’re easy to handle and see going into the ground in late spring. Now we’re enjoying some really robust plants. When I was a kid, I remember my dad speaking disparagingly of fields of soybeans — I think he was disappointed to see mono-crops taking over the sandhills of South Carolina (I think I’m projecting….). Or maybe he just didn’t like to eat soybeans then. I really didn’t hear much about soy again until I went vegetarian in college and ate all kinds of incarnations of the bean. When I moved to Asheville about 15 years ago, I re-discovered it at a sushi restaurant as “edamame”. Yum. Anything that has lots of salt, I love. Plus it’s fun to eat – it’s a Japanese version of boiled peanuts. Sow True Seed had a variety of edamame seeds this spring, so I planted one row in the smallest (4×4 foot) raised bed, so not alot of plants but they are producing more than enough for our family. 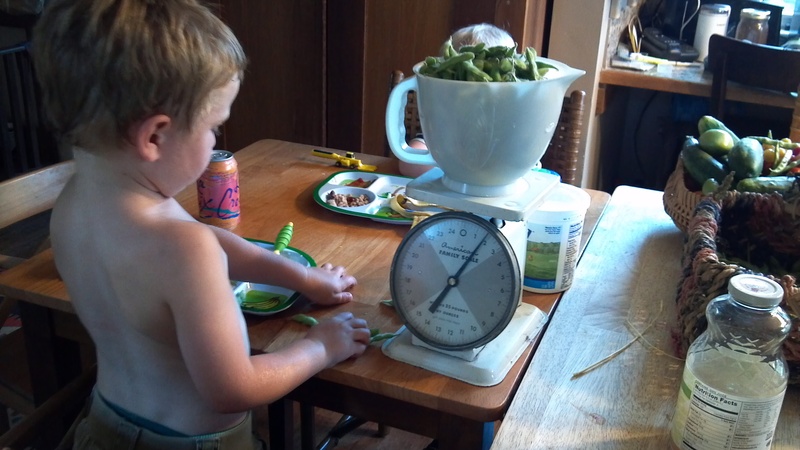 My kids are not into harvesting edamame or any other small vegetable that requires patience to harvest. There are lots of mosquitos out and it’s hot, so it’s not really fun for long for anyone. However, they really wanted to pick every tomato, green and red. 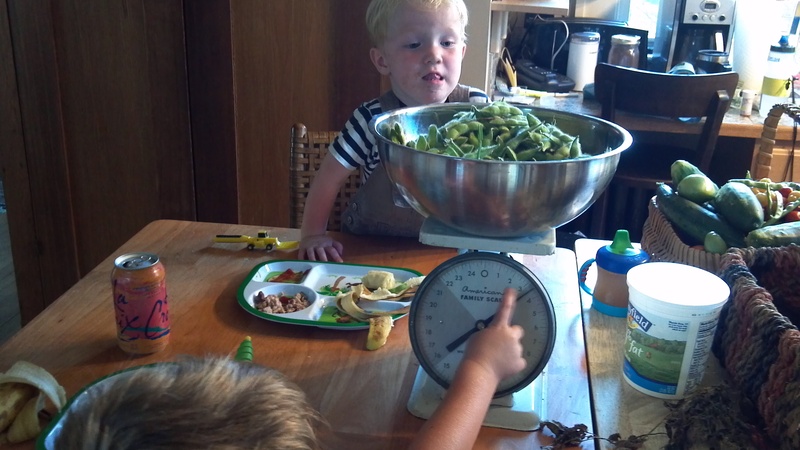 They did enjoy getting to see how much we (ahem, “I”) harvested by weighing them on the kitchen scales. 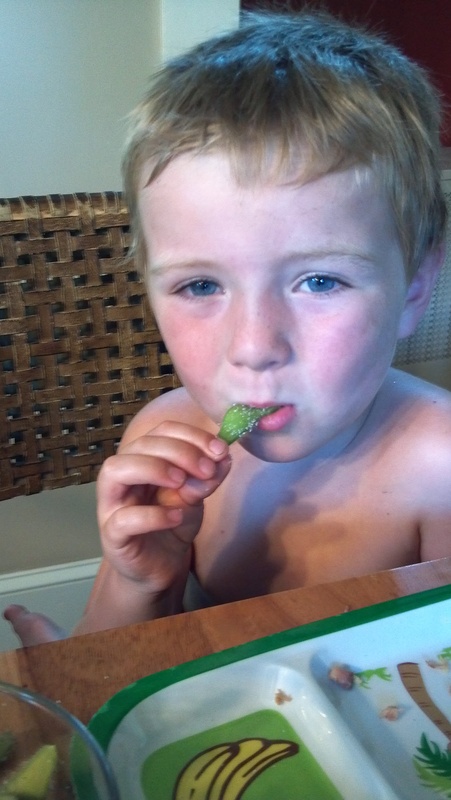 Notice there are no photos of my 2 year old eating edamame. 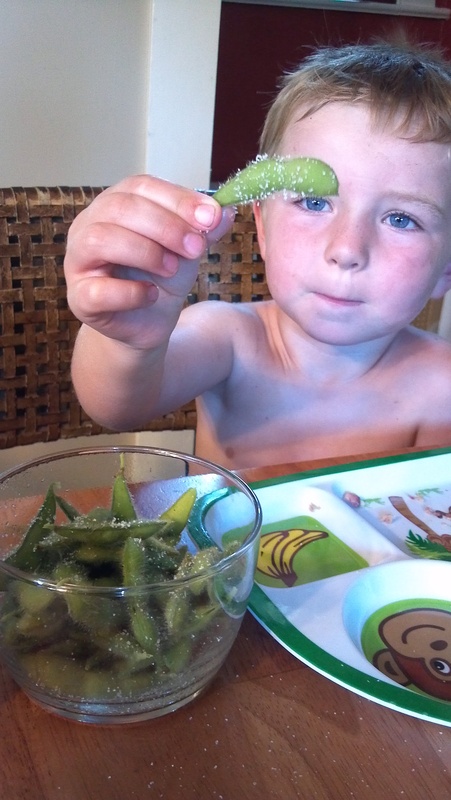 He likes to lick the salt off, then get the beans out of the pods and look at them. We’re working on getting him to expand his vegetable repertoire. Not easy, but at least he has a good example set by his older brother! 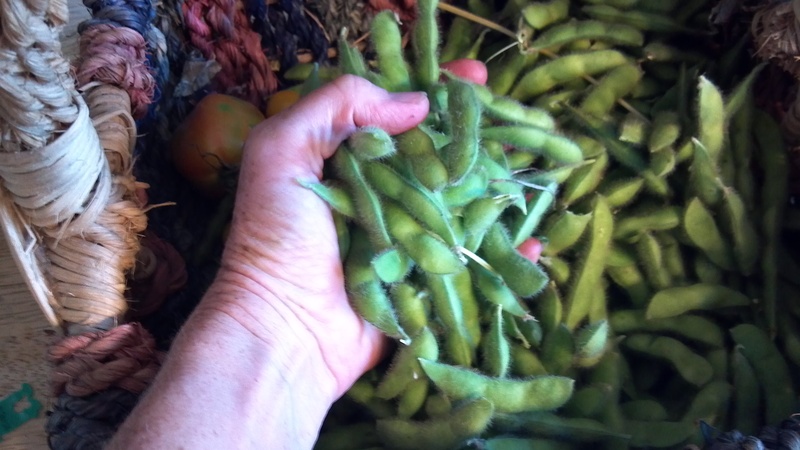 I love edamame…I was wondering just this week if it would be hard to grow them in a small garden. You totally just answered my question! I love eating edamame. I hard a hard time growing it in my climate, though, so it’s store bought for me. Darn.